Providing you the best range of soft plc embedded software with effective & timely delivery. 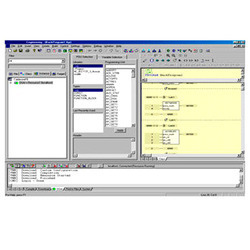 The Soft PLC Embedded Software designed with OSAI OPEN CNCs uses a graphical environment based upon IEC61131-3 and the machine logic is developed using Structured Texts. The PLC Tool is designed with functions for debugging and utilities such as changing on the fly and warm start of logic to speed up Commissioning. This is very use full for PLC Tools.